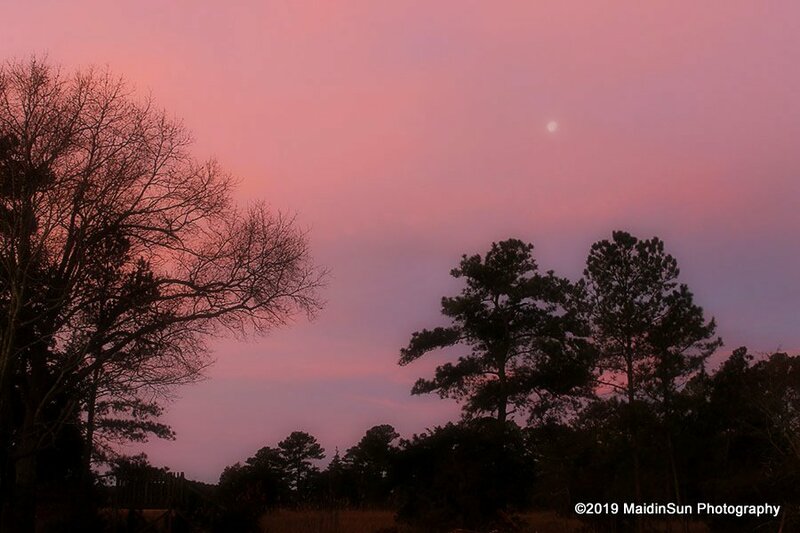 An early morning in January when the moon and sun gazed at each other. For the past few months, I’ve been waking up around 5 or 5:30 in the morning. It’s still dark and if the morning is especially cold, I don’t always leave the bed right away. Instead, I burrow down under the covers, snuggling into the warmth of the bed and M and (very likely) the cats who like to sleep on either side of my legs. Our waterbed is a king sized bed but it often feels smaller. We sleep, especially on chilly mornings, in a puppy pile. It’s lovely to take a little time to enjoy the cozy sweetness of it all. It’s also a gentle way to wake up to the day and to the world. When I get up, and after the usual morning ablutions, I walk softly and carefully through the dark of the living room trying not to stub my toes or smash my knees into anything. Or step in anything. You never know with cats. Cold weather brings in the occasional mouse. I think they fold themselves into tiny shapes that fit inside a small crack in a log that was brought in for the woodstove. But I’d know if there was a dead mouse lying in wait. I’d hear the cats chasing it down during the deep hours of the night or the wee hours of the morning. They are never quiet about the chase and kill. Neither are the mice. Where night and day meet. Sometimes it is not so dark. Sometimes it is quite bright as the light of the moon streams in the fan window in the living room (what the realtors call a great room because of the high ceiling and the fan window that sits way up as if it wants to touch the sky). Even a waning gibbous moon has enough light to see by when it hangs like a decoration in the middle of the window. The woodstove, if we’re using it, might put off some light, too. It depends on whether or not there is enough wood left to flame. In the flight path on a February morning. I make my way to the kitchen where I finally turn on a light. The beginning of the day is not entirely mine. I turn on the coffeemaker for M. I start the water for tea for me. I clean up the cat dishes and we start over, opening a can of cat food and dividing it between Izzy and Bella (the cats). Izzy and Bella stand in their corners, one at each end of a stainless steel tray where I place the bowls of food. Izzy gobbles down most of her food. Bella, the diva-est of the divas, daintily eats a small portion of her food and walks away. I wait for Bella to do this because if I don’t, Izzy will gobble down Bella’s food. She’s a tad bulimic in that she’ll binge and purge if allowed to do so, usually right on the tray or the bowls of food. Gross, Izzy. Gross. 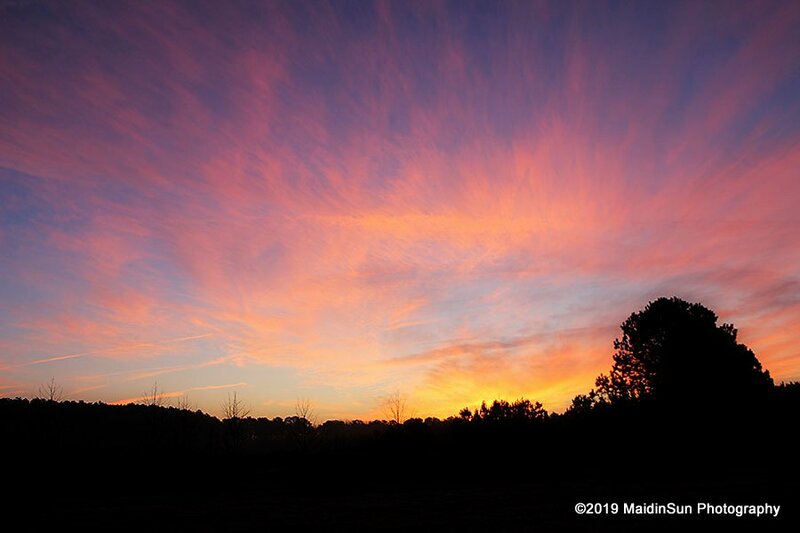 Sometimes the sunrise looks like colorful sherbets mixing in the sky. After Bella saunters away and I put her bowl up where Izzy can’t get to it (Bella will come back later and I’ll place it back on the tray when she does), I steep some tea and when it’s ready, pick up the mug, turn off the light, and stare out the kitchen window to see what I can see. It takes a few moments for my eyes to adjust. This time of year what stands out most is the morning star which is not a star at all but a planet. 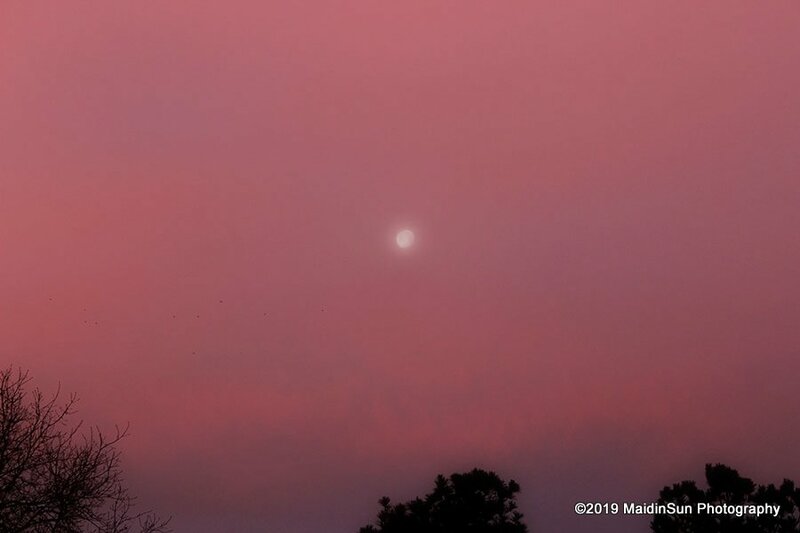 Venus shines bright over the pond in the southeastern sky. Venus has been sinking downward toward the sunrise while another planet, Jupiter, has been rising. 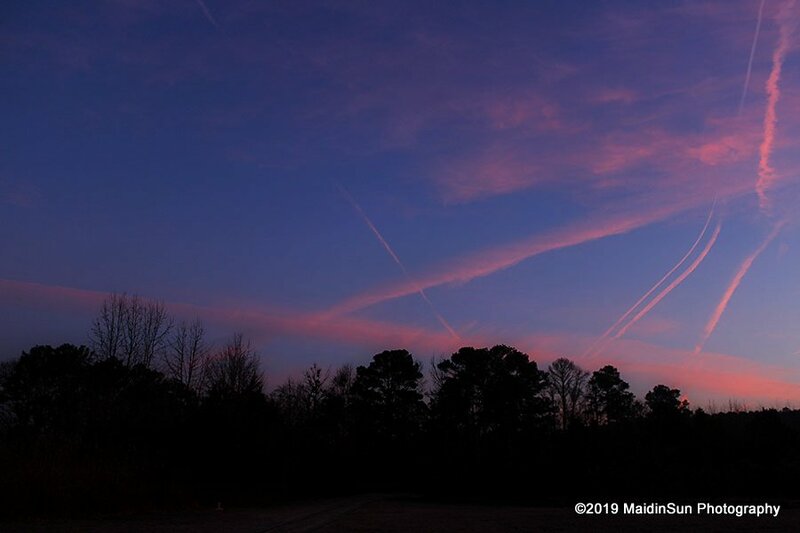 The two met up on January 22, passing each other on their respective ways down or up and at some point a week or so later, the crescent moon joined Venus and Jupiter in the early morning sky. If it’s not too cold (32°F or above), I’ll wander outside to look at the stars and the planets and the Milky Way when it’s visible. Even when it’s below freezing, I’ll sometimes wander out just long enough for a quick peek. It has to be quick because I usually just slip my feet into some flip-flops or go barefoot. One of the wondrous things about those early morning hours is watching as the stars begin to wink out and the sky begins to lighten. It goes from black of night to the blue hour (which is not an hour at all; more like 20 minutes). If you’re a photographer, you’re familiar with the blue and golden hours, those periods just before and after sunrise and sunset when the light is softer and more evenly diffused. There is a slow steadiness to sunrise, as it it’s not in a great hurry to get here. It is a reminder that very often change is small and gradual, slow and steady. Out for a morning walk. 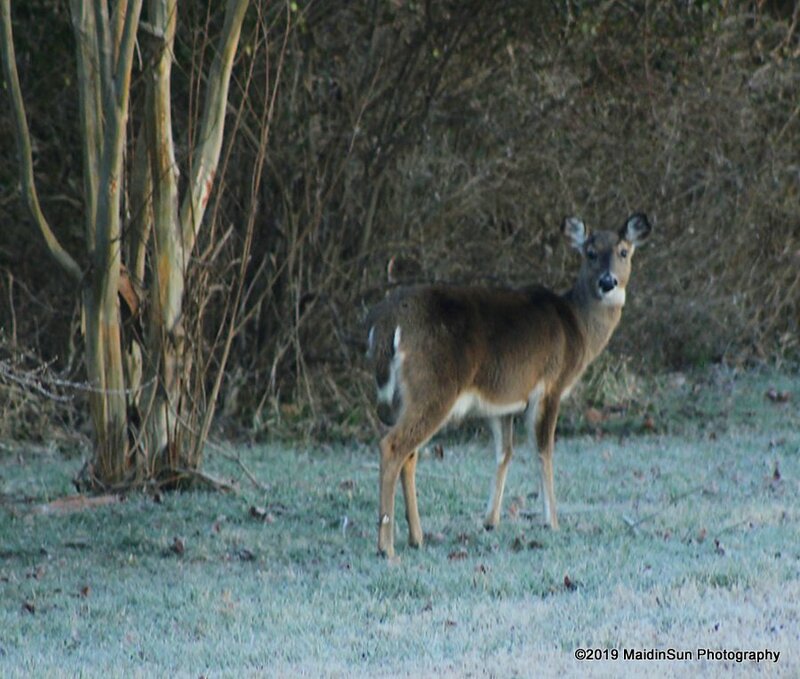 The best time to spot the wildlife around here is near sunrise or sunset. The deer come walking out of the future woods, a hawk who has been hanging around lately stations itself either in the sun somewhere or near the bird feeder. It appears that our hawk likes the suet, but I’m pretty sure it is also eyeing the other birds and the occasional squirrel as potential meals. The otters come out to play in the early morning hours, too. There are two who hang out near the pond and two out by the dock. Flocks of blackbirds fly in and out with crows usually leading the way, and the geese are often honking and on the move during those sunrise and sunset times. 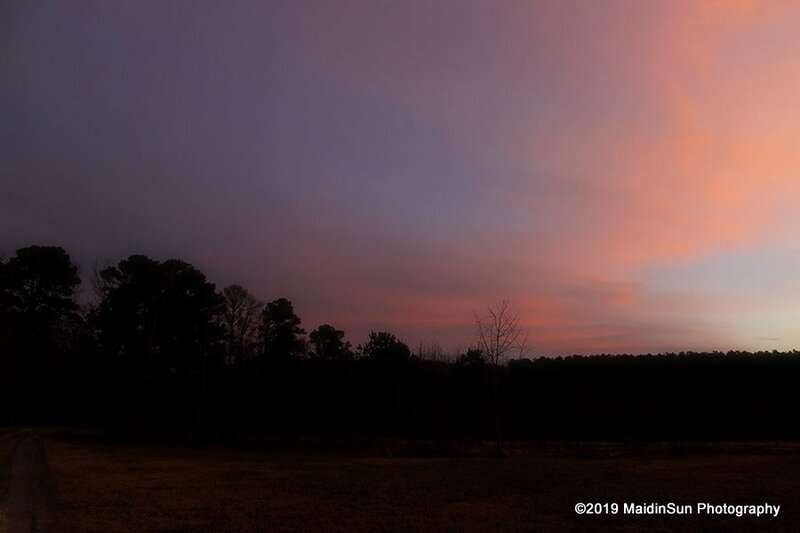 Before the sun rises up from behind the loblolly pines by the pond (sunrise this morning was at 7:02 AM), after I’ve stepped outside for a bit (if I stepped outside at all), the rest of the morning routine begins. I write a little (Morning Pages, but by my own rules because some mornings three pages are not enough and other mornings two sentences feels like too many), step on the mat for yoga and meditation practices, pick up the weights for strength training if it’s a weight day, and then have some breakfast before I go out for a morning walk. I’ve been hooked on an egg and veggie sausage with a small side salad of mixed greens lately. Sometimes I eat some kind of lentil or bean dish with rice, or a rice pudding with apples, raisins, and dates (no sugar added because the fruit is sweet enough). Leftovers from dinner occasionally show up on my breakfast plate, too. 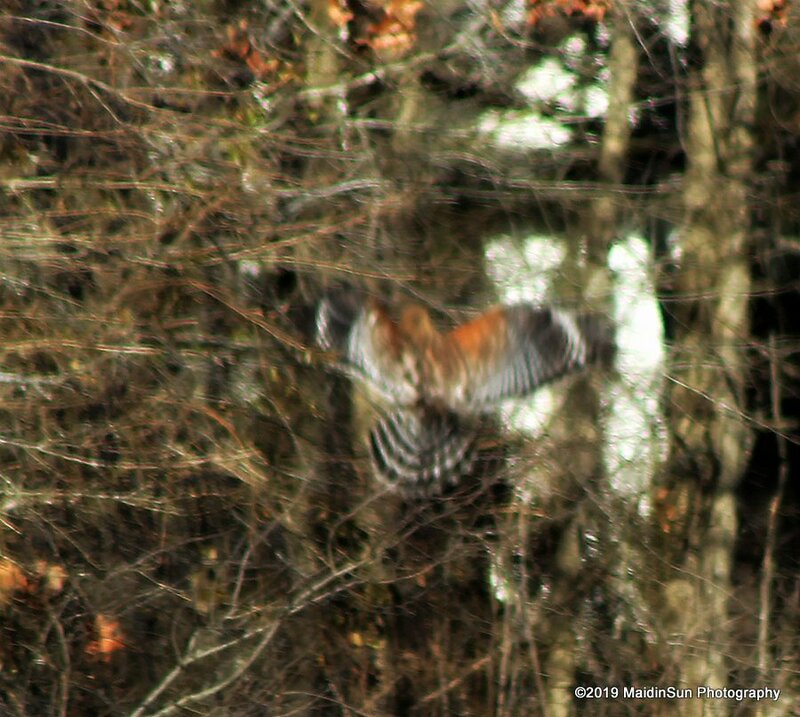 This is a terrible picture, but I brought it to you so you can see the hawk’s beautiful red shoulders. It’s a good way to start the day, rising before the sun. If you haven’t done it lately, I highly recommend that you give it a try. 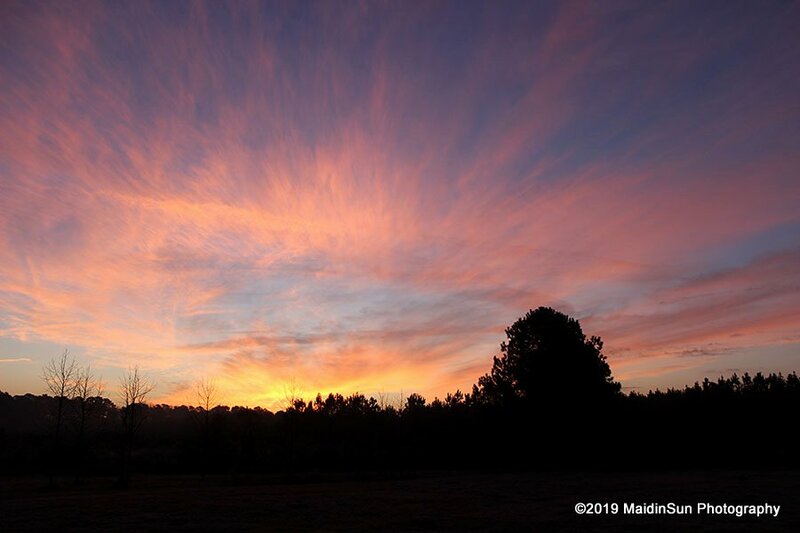 I was inspired to write this post by Dale’s Morning and the Sun is Just Rising (which is much more beautifully written than mine). In other news, Frank (of A Frank Angle) and I collaborated on a post, On Shadows. My apologies to Frank for not posting about this on the same day the post appeared. I know this is stating the obvious but… I’ve been in and out of blogging lately. More out than in, I think. 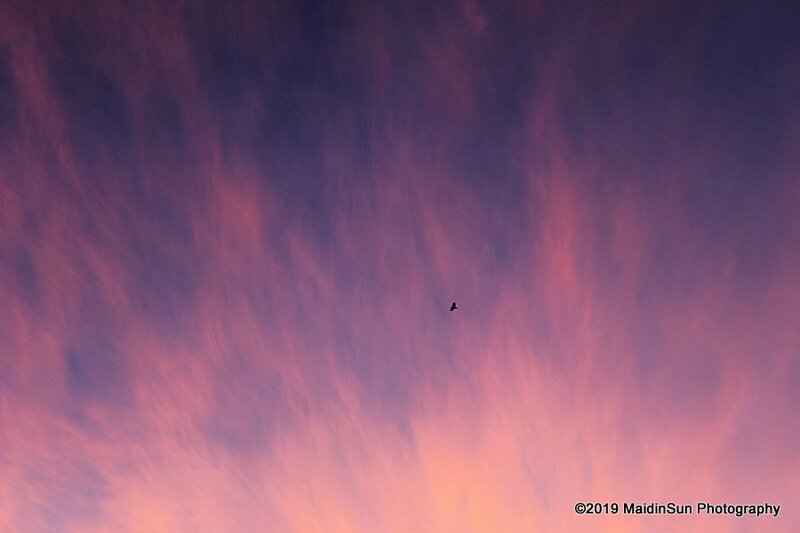 A crow on the sky path, leading the day forward. Thank you for stopping by. Let’s meet at the dock for sunset which is scheduled for 5:34 PM. It’s been relatively warm today (60’s), but the temperature is supposed to drop pretty quickly this evening so I would suggest wearing layers, just in case. It does get pretty cool once the sun disappears behind the trees. A few of the 10,000 reasons to be happy: 1,011) The amazing opportunity to get to know a red-shouldered hawk who is either very brave or very hungry. Otherwise, I don’t think he would hang around so close to the house. 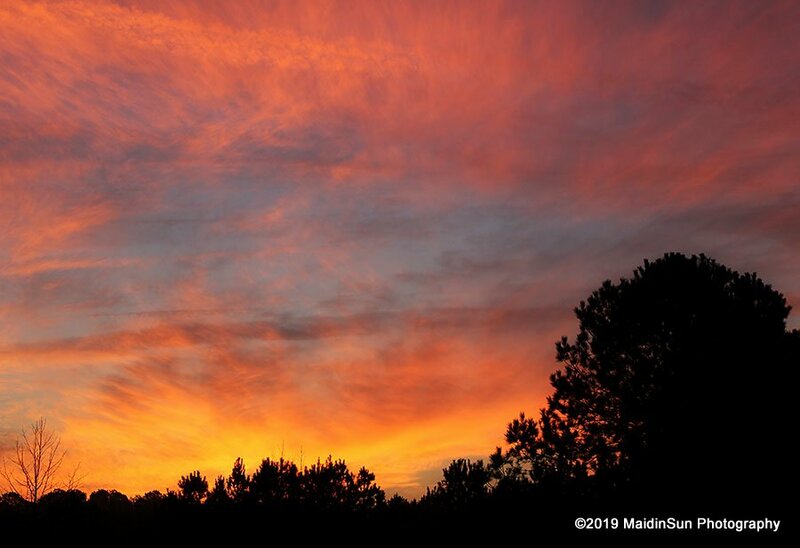 1,012) The lessons that sunrise teaches when you’re willing to show up and listen. 1,013) Morning routines, and being flexible about them. 1,014) A place where otters live and play. 1,015) Waddle the Duck. You’ll be seeing and hearing more about him soon (if you follow me on Instagram, you’ve already met him). An otter has been here. I wake when Shasta says it’s time, which often is right about the time the sun decides to peek up over the hill. But I cheat now and then, going back to bed after she goes out and has breakfast. Winter has decided to arrive this month – right after I made plans to travel to California the end of this month, and I’m taking it personally. I am offended. Your sunrises and sunsets are beautiful, as are your thoughts. I envy you your self-discipline – but am working on getting myself in gear to practice a wee bit of yoga each day. Or nearly each day. A deterrent is the Shasta dog, who thinks when I get on the floor I am there to play. Thank you, Carol. 🙂 I don’t know if it’s self-discipline so much as necessity. The teacher for the yoga course I’m taking (The Art of Self-Care) has been very clever in the way she has introduced very small changes each week. The changes are generally so small that the mind doesn’t have time to balk at them. For yoga practice, she suggested just getting into child’s pose (or something close to it) for about 30 seconds or so, and then deciding what to do from there. Continue or not. If child’s pose is enough for the day, it’s enough. Izzy cat thinks I’m on the floor to play, too. I include that in my practice. Izzy likes the yoga strap so every now and then I wave it at her. Or she wants me to pet her so I do that. The only problem is that she gets under me when I’m doing a downward facing dog and I’m afraid I’ll collapse on her someday. I heard you were getting a lot of snow out your way. Stay safe and warm. I think if I had the surroundings you have, I would get up earlier more often – sleep or no sleep. Loved your collaboration with Frank, too. And how lucky to have captured that beautiful hawk! Thank you so much, Dale. 🙂 Yes, the beauty of this area does provide a lot of incentive to get up and see what’s happening. Frank makes collaborations easy with his wonderful use of words. It really is gorgeous. And he does do that, our Frank. Beautiful post as always Robin- and your morning routine is so focused I’m very impressed and wish mine were a little more zingy. I’m tempted to follow Dale – she’s so lovely isn’t she, but terrified of adding in more blog posts I miss reading due to lack of time. It’s a conundrum! This was so beautiful, Robin! (And I liked Dale’s post, too. Neither better nor more beautiful than the other–just different people and different posts. ) I’m usually up between 5 and 5:30. I like that time of day, too. I’m a definite morning person; my husband is not. 🙂 So cool to see the hawk regularly and the deer. No apologies necessary – but a hardy thank you for supplying the wonderful photos … and I welcome your visitors to stop by my little corner of the world. 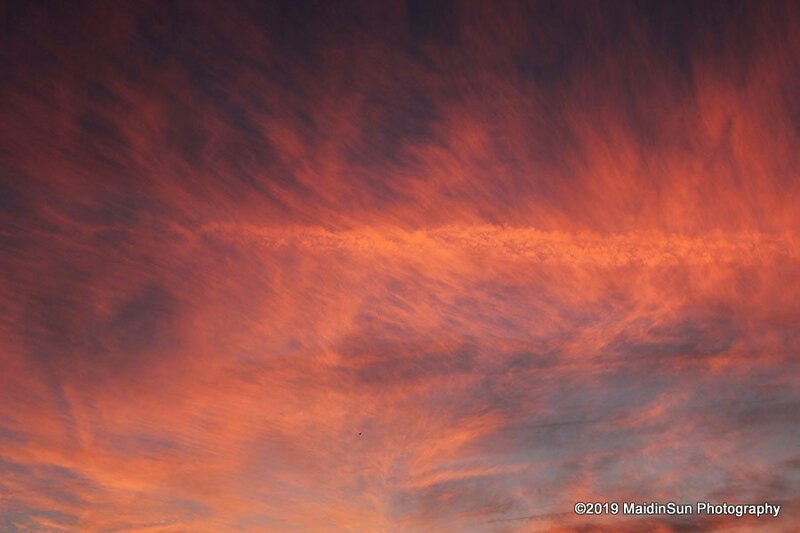 Hey – wonderful words as always … and I love the pink and orange skies! Cheers to your walks. This is just beautiful, all of it, the writing and the photos and the sentiment. I used to get up very early and often saw the sunrise. But I’ve been training Katie to sleep in a little later so I’ve seen less beautiful sunrises lately. I don’t know…maybe I should let her get me up earlier! I love the beautiful hawk shoulders, was well worth sharing that image! 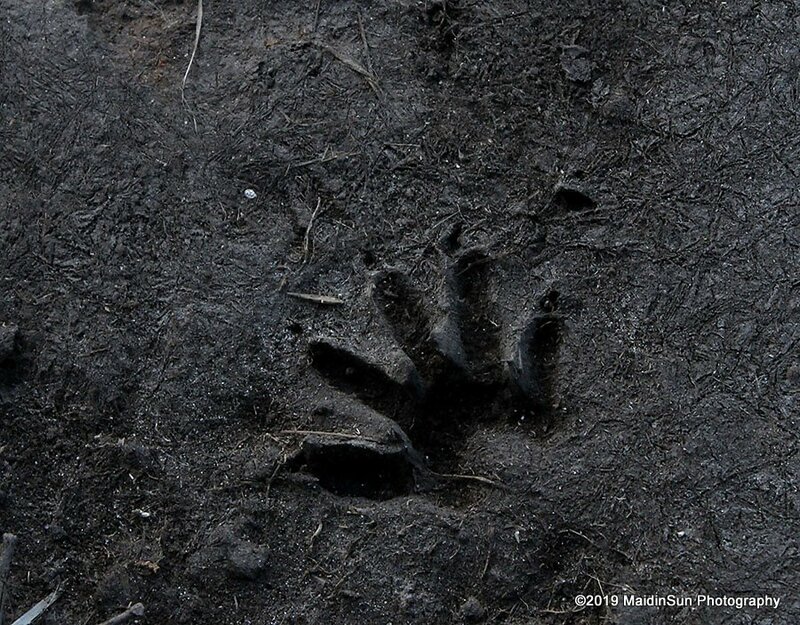 And I don’t think I’ve ever seen an otter footprint…I thought you had made that impression with your own hand! Thank you so much, Dawn. 🙂 I go through different phases with the early rising. I’d like to say I get up when I feel like it and sleep in when I feel like it, but the cats have a say-so in that. They wake me when it’s time to eat breakfast if I’m not up. They have decided 6 AM is the best time for them to eat breakfast and somehow they always know when it is 6 AM. Fortunately for them, I’m in a very early rising phases right now so I’m up before they bother me about it. The problem with that is they might decide 5 or 5:30 is a better time (now that we’re in the habit of it) and we’ll all have to retrain each other. Thank you, Eliza. 🙂 Well, that’s what the staring out the window is about — the “slow” part of my “slow and steady” morning routine. I truly do take my time most days (because I have that luxury). After years of terrible sleep (mostly lots of insomnia), I’m finally getting the hang of a good, long night’s sleep (which means I go to bed ridiculously early right now). Beautiful captures Robin. And I love those quotes from Mary Oliver, she is a favorite peot. Thank you so much, Arlene. 🙂 She’s a favorite of mine, too. “Here you are, alive. Would you like to make a comment?” Yes please – may I say what a fabulous post. The dawn photos are just reward for an early riser who goes barefoot in the frost – love the astral narrative too – and your images where Frank takes an angle on shadows. Like some others, I do admire your routine. I may try to set one like it myself at some point. And the pictures were lovely. Thank you, Lisa. 🙂 I started small with the routine. One small change at a time is a lot easier than trying to revamp my entire life all at once. 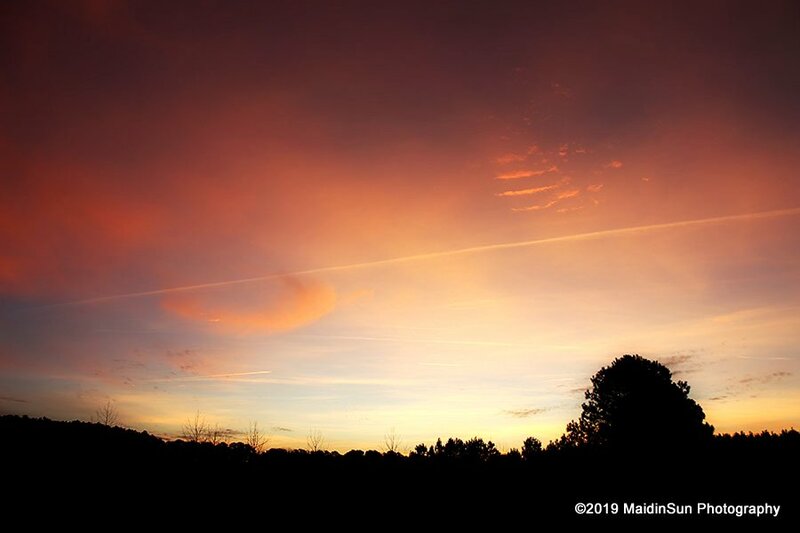 This post is just like that time around dawn Robin – there is often a magical feeling to that time of day and I felt that through your words. Beautiful mornings, thank you for capturing fleeting moments for us. I love how often you ‘make a comment’ about the world around you, Robin. 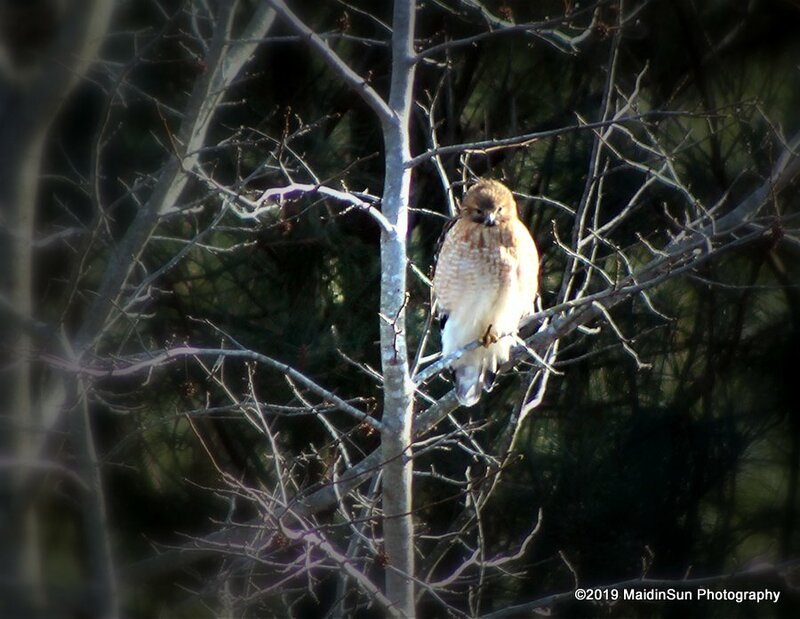 The picture of the red-shouldered hawk is beautiful! Lovely photos and beautifully written post. My mom always wanted to see the sunrise, and like her, so do I. Some nights I do not sleep; and then some mornings I cannot sleep. So, I have no routine. I am suppose to be practicing yoga. One day and too many moves was as far as I made it in yoga. Finally, I am reading again a little each day. I will not “catch up”. So I read when I can. Thank you, Linda. 🙂 I think “catch up” is highly overrated. It’s always better to just start where you are. I’ve been looking at some gentle yoga that was recently recommended. Larry Payne’s Prime of Life. I haven’t gone beyond a quick look, though, so I’m not sure about it just yet. I’ve given up on early mornings lately. After all those years of getting up early to get to work, it’s nice to just sleep in. I’ll admit though, the early morning is a special time of the day. The hawk has been hanging around our backyard. The rabbits never did come back after getting cleaned out a few years ago, but we still have squirrels. I don’t know for how long though. . . Thanks for the beautiful pictures and text! No thanks. I don’t need rabbits. I wouldn’t mind the ground squirrels getting thinned out. And the moles! Unfortunately, hawks don’t eat moles. That’s the domain of a beagle digging up the yard. Insert an eye roll here. You need a fox! They are really good at cleaning out the moles and voles. (Snakes are, too, but a fox is cuter.) We had very few moles and voles left on our property in Ohio after a fox moved in and whittle down the population. That would be awesome, but it’s way too populated here.